Auguste Blackman was born in 1957, the eldest son of artist Charles Blackman and his writer wife Barbara. That was a good thing and a bad thing. Good in that Auguste grew up living the privileged life, travelling the world and helping his father in his studio. Bad in that he believed all he had to do to be a great artist himself was to be Charles Blackman’s son. Even after a sell-out exhibition in 1981, it dawned on him that he had no voice of his own, no real life experience, and so he quit the scene. Later he recognised that to emerge from his father’s giant shadow, he had to reinvent himself, learn the basic elements as a foundation to a career, and be judged on his own merits. And so, Auguste gave up substance abuse and studied Fine Art at West Wollongong TAFE, including an extra year of Ceramics. The successful results of those actions are now on display. A recent Wollongong exhibition with fellow artist and medico, John Nearhos, explored Love and War. It included the Shinichi Series, a poignant story of a three-year-old boy who was burned to death on his tricycle in the Japanese World War 2 atomic bomb blasts. 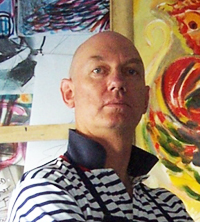 In September 2005, Auguste Blackman, now a confident artist in his own right, held his first Melbourne solo show. It featured the series "Tramlines", with Blackman using the tram as a metaphor for his own journey in life, the tracks being a symbol of the parallel lives he and Charles shared.